Hey, Cricut fans! It’s Cori from Hey, Let’s Make Stuff back with a fun paper-crafting tutorial for the start of the school year! Wait! Can you believe we’re already almost the new school season? This is a big year for us—our twin boys start preschool! They’ve been attending daycare at the preschool since April, but soon they’ll officially be in school. I can hardly believe it. If someone has the secret for slowing down time, please let me know in the comments! This year I’m making my boys commemorative mini scrapbooks for the new school year. One of my favorite things to do in Cricut Design Space is taking one of the Make It Now projects and customizing it for something else. 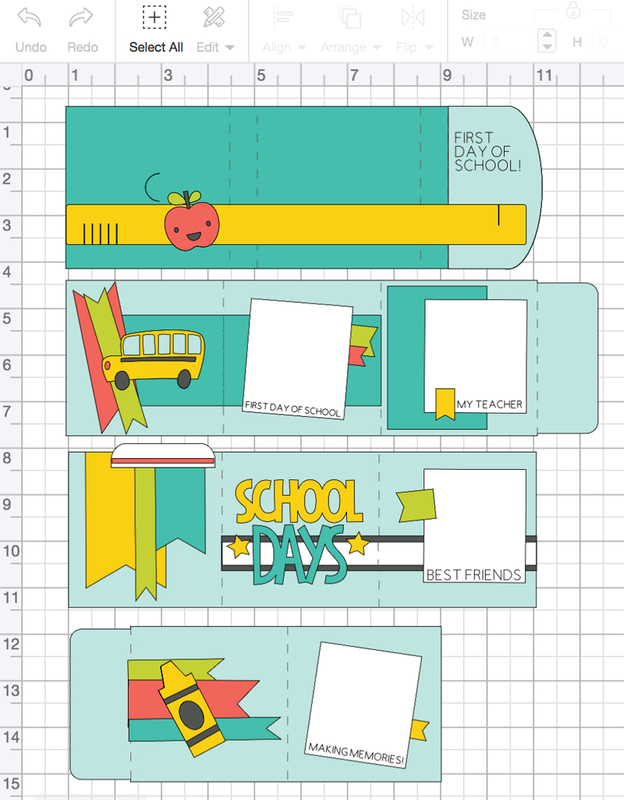 This time, I’ve used the Love Mini Album and reworked it for Back to School! Click here to get the Design Space project. You can go in and customize the text layers (for the front, I left the name blank —feel free to add your kiddo’s name like I did! ), change the colors, or add or remove elements from the book. Then you’re ready to cut! Pin this to save for later and share with your friends! Start by cutting out your project on your Cricut. I used my Cricut Maker, which uses the Scoring Wheel (I love that thing!). 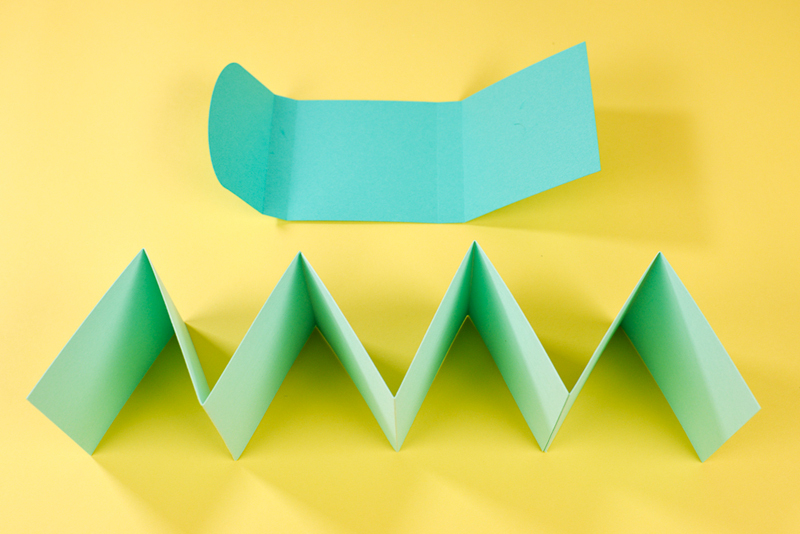 Make sure to follow the instructions for each color of paper—there are layers that also need the pen and the scoring wheel or stylus. Cricut Design Space will prompt you to insert the tools when needed. 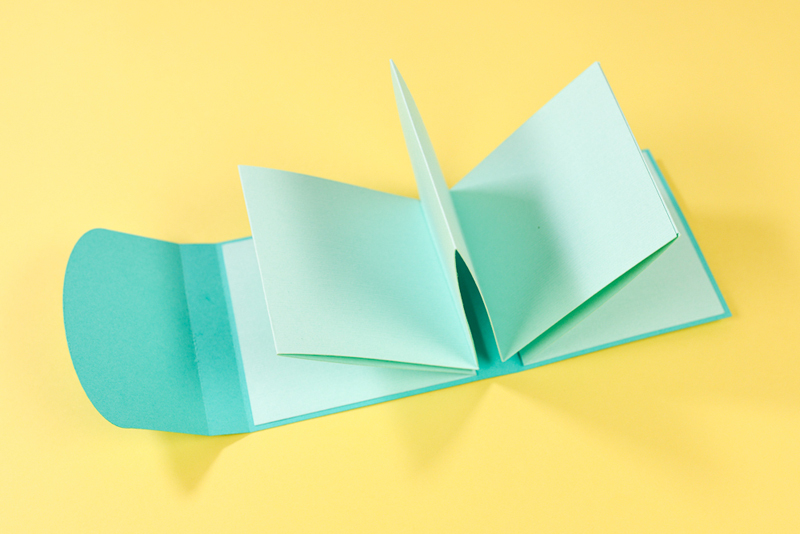 To create your mini scrapbook, fold the teal cardstock so that it forms a little square book. 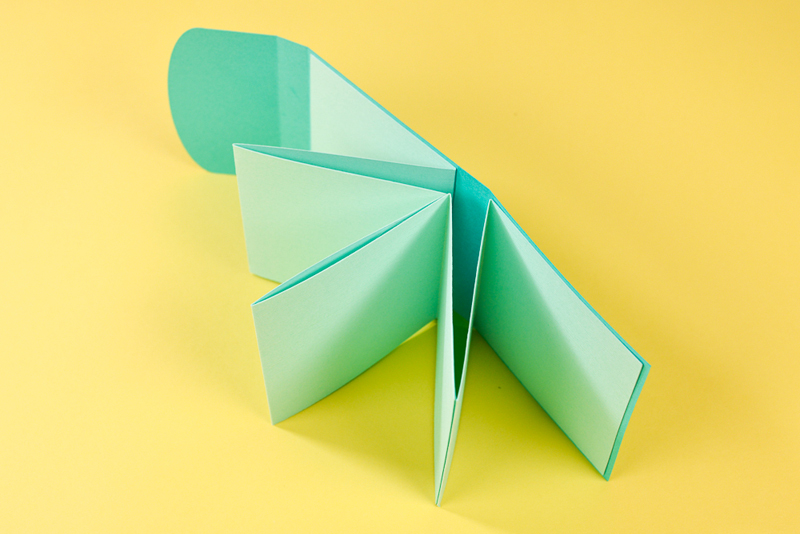 Then fold the light blue pieces as shown, and glue together using the tabs. Then glue the interior pages to the exterior book as shown. 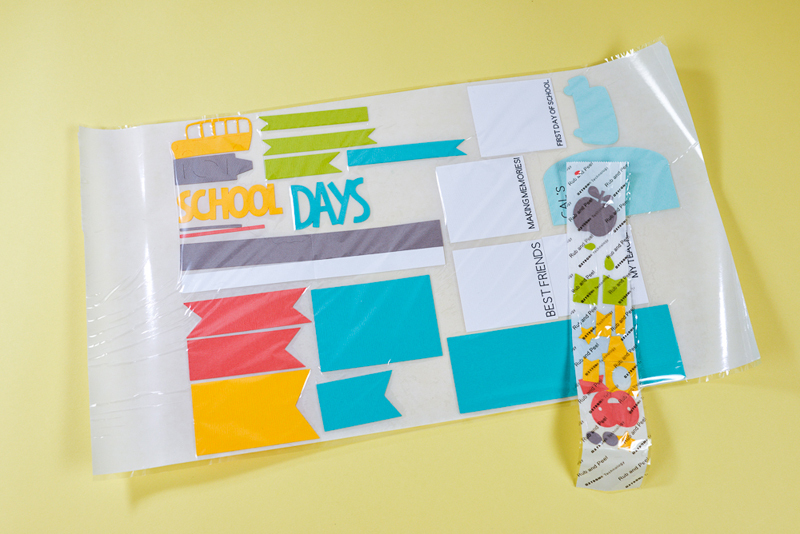 Like any scrapbooking page, you’re going to end up with a lot of cut pieces. How you attach them to your mini book is up to you. I really like using my Xyron sticker machine—it basically turns any flat piece of paper into a sticker! Perfect for projects like this. You can also use spray glue or glue tape (the kind that comes in a little dispense. Glue dots will probably work too! 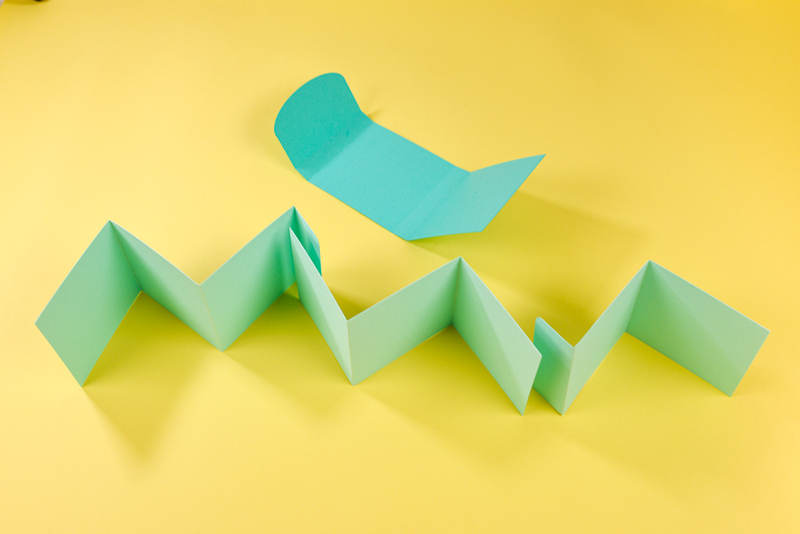 Following the design in Cricut Design Space, adhere all of your different pieces together to your book, making sure the scored pieces line up with the folds of the book. 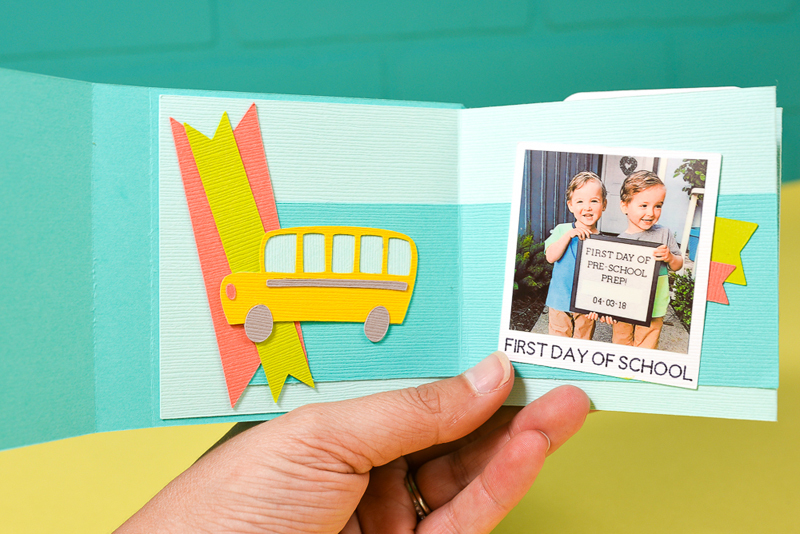 Then print out 2"x2" photos from your child’s first day of school and affix them to the white photos pieces! The design of the white paper makes it look like they are Polaroids. So cute, right? I wish you and your family the happiest back to school! Make sure to check out a few other Cricut back to school projects on my blog: Periodic Table Clipboard, Teacher Apple Candy Pouch Cards, and this adorable Apple Tote Bag! 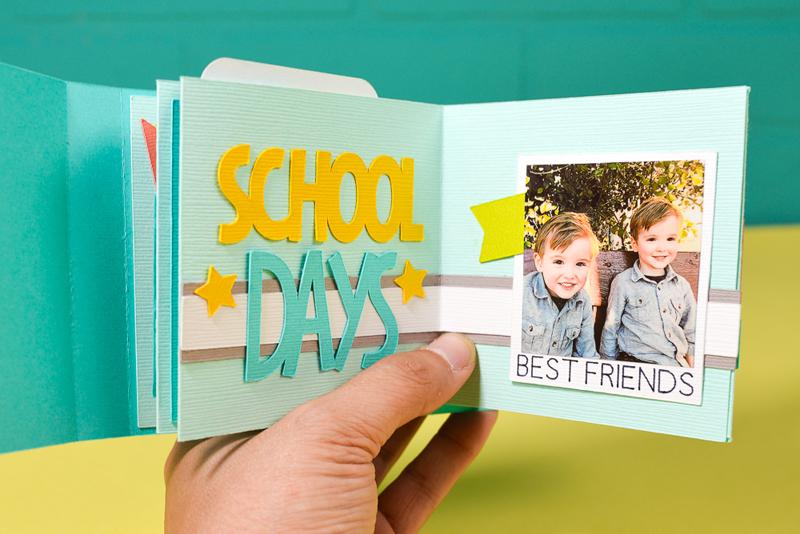 Show us your Back to School projects by using #CricutMade. Reuniting Families. Adding Special Touches.